Logins this hour: 7814 ? 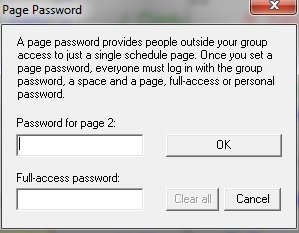 Subset page passwords provide people outside your group access to a single subset page. In OnCall, click on the Schedule Content icon, in the icon toolbar. In the Schedule Content box, hold the CTRL & ALT keys together and click on the subset page icon you want to password protect. The Page Password box appears. Set the subset page password and full-access password. Then click OK.
Once you set a subset page password, everyone must log in at Amion with the group password, a space and then the page password, or full-access password. 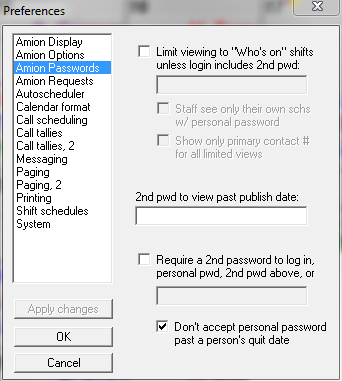 For example, if the group password is 'schedule', the subset page password is 'site' and the full-access password is 'all', the password to log in with at Amion would be, 'schedule site' or 'schedule all'. For additional schedule password options, go to File / Preferences / Amion Passwords.